Juno – Multipurpose Opencart Template Created by jetimpex. 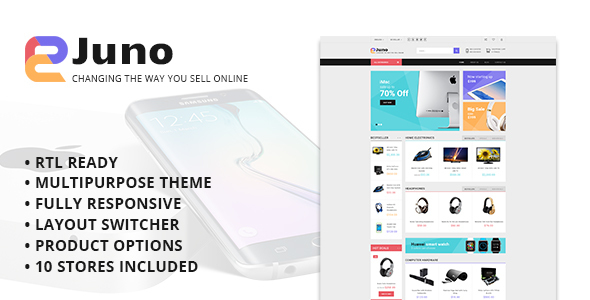 This templates have specific characteristics, namely: Juno , fully featured multi-purpose OpenCart template is pre-loaded with 10 ready-made stores for home electronics, headphones, computer hardware, mobile phones, interior and furniture, sports and outdoors, clothing and accessories, health and beauty, toys and hobbies, and jewelry. Its clean, flat . You can use this Juno – Multipurpose Opencart Template on Ecommerce category for Clothing and accessories, computer hardware, ecommerce, electronics, health and beauty, multipurpose, opencart, responsive, shop, store and another uses. Juno , fully featured multi-purpose OpenCart template is pre-loaded with 10 ready-made stores for home electronics, headphones, computer hardware, mobile phones, interior and furniture, sports and outdoors, clothing and accessories, health and beauty, toys and hobbies, and jewelry. Its clean, flat style perfectly fits for the purpose. The theme’s layout is user-friendly and easy to navigate. The main menu was presented by means of a hamburger icon, which remains fixed to the top of the page as a user navigates your site. In order to draw the users’ eye to your special offers, the header was enhanced with a responsive slider. Next to it, there is a set of bold product banners that were organized in an easy to scan manner. At the very top of the page, there is a product countdown banner. Product badges were also added to new and discounted items. Ajax Cart, Custom Pages, Newsletter Subscription Pop-up, Google map, Social Options, and a whole lot of other smart functionality were added to the theme’s pack. Go and check this out by yourself.